Paul is the inventor of the Domain Name System (DNS), which he created in the 1980s at USC's Information Sciences Institute and where he was later the Director of ISI's High Performance Computing and Communications Division. After the formal creation of the Internet Engineering Task Force (IETF) in 1986, DNS became one of the original Internet Standards. Paul has been associated with the IETF since its creation, chaired several DNS and non-DNS working groups, and was Chair of the IETF from 1994 to 1996. Paul was program manager for networking at ARPA in the early 1990s, supervising efforts such as gigabit and optical networking. Paul has held leadership roles at several Silicon Valley networking startups, including @Home, Software.com (now OpenWave), Fiberlane (now Cisco), and Siara (now Ericcson). Paul has dual B.S. degrees in Physics and Electrical Engineering from MIT, and a Ph.D. in Information and Computer Science from the University of California, Irvine. Vint is vice president and Chief Internet Evangelist for Google. He is responsible for identifying new enabling technologies and applications on the Internet and other platforms for the company. Widely known as a "Father of the Internet," Vint is the co-designer with Robert Kahn of TCP/IP protocols and basic architecture of the Internet. 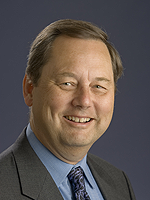 From 1994-2005, Vint served as Senior Vice President at MCI. Prior to that, he was Vice President of the Corporation for National Research Initiatives (CNRI), and from 1982-86 he served as Vice President of MCI. During his tenure with the U.S. Department of Defense's Advanced Research Projects Agency (DARPA) from 1976-1982, Vint played a key role leading the development of Internet and Internet-related data packet and security technologies. From 2000-2007, Vint served as chairman of the board of the Internet Corporation for Assigned Names and Numbers (ICANN) and he has been a Visiting Scientist at the Jet Propulsion Laboratory since 1998. 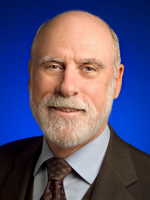 He served as founding president of the Internet Society (ISOC) from 1992-1995 and was on the ISOC board until 2000. Vint is a Fellow of the IEEE, ACM, AAAS, the American Academy of Arts and Sciences, the International Engineering Consortium, the Computer History Museum and the National Academy of Engineering. He holds a Ph.D. in Computer Science from UCLA and more than a dozen honorary degrees. 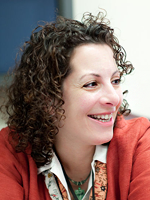 Beth is Founder and Director of The Governance Lab. Funded by a grant from the John D. and Catherine T. MacArthur Foundation and the John S. and James L. Knight Foundation, the GovLab aims to use advances in technology and science to change how we govern to improve people’s lives. Beth is a visiting professor at both New York University’s Robert F. Wagner Graduate School of Public Service and the MIT Media Lab, and is on leave as professor of law and founder of the Institute for Information Law and Policy at New York Law School. She served in the White House as the first United States Deputy Chief Technology Officer and founder and director of the White House Open Government Initiative (2009-2011). UK Prime Minister David Cameron appointed her senior advisor for Open Government, and she served on the Obama-Biden transition team. Nii pioneered Internet development and expansion throughout Africa for nearly two decades, establishing some of Africa's first Internet connections and helping set up key organizations, including the African Network Operators Group. He also was the founding chairman of AfriNIC, the African Internet numbers registry. He earned a PhD in Computer Science in 1977, from the State University of New York at Stony Brook and helped establish the Computer Science Department at the University of Cape Coast in Ghana, where he has taught since 1979. He was the first African to be elected to the board of the Internet Corporation for Assigned Names and Numbers (ICANN) and served as an at-large director of ICANN for the African region from 2000 to 2003. 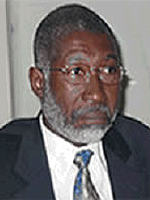 Dr. Quaynor was a member of the United Nations Secretary General Advisory Group on ICT, Chair of the OAU Internet Task Force and President of the Internet Society of Ghana. In 2007, the Internet Society awarded him the Jonathan B. Postel Service Award for his pioneering work in advancing the Internet in Africa. He is a member of the IGF Multi-Stakeholder Advisory Group (MAG).